Case studies are one of the excellent methods, especially in business and marketing, where a scenario can be best explained with a similar situation in the past. The business environment is dynamic and there is a lot of inflow and outflow of information from different sources. Proper information is required to deal with different business problems and resolving them in the least possible timeframe. The Case Study method in business helps to understand, interpret, analyze and resolve a present business situation more effectively with past experience to come up with a strategy for the future. The statistics are staggering, in the year 2014 – 15, Harvard Business School sold about 12 million case studies to around 4000 business schools worldwide. The report also stated that 19 of the top 25 business schools worldwide considers the case study method as one of their major teaching tools. Case Studies bring out either a simple or complex situation for analysis and study. Case studies form the basic foundation for learning different business concepts and paradigms. Case study method is a way of active learning and it gradually helps the participants to build and channelize their thought process. Like educational institutions, business houses also use the case study method for training employees, gaining insight and incorporating the learnings into their business processes. Case studies can have a definite solution(s) or it leaves a point of discussion with varying views on it. Case studies give consumers the confidence to trust a product or service by providing relatable human evidence of its value. Unlike a testimonial, a case study puts the value in action, taking users on a specific journey through the usage of a specific product or service. It’s word-of-mouth validation that marketers covet, and consumers rely on to make decisions. A rich customer narrative, loaded with direct quotes and characterizing details, helps prospects relate to your product or service, and impresses them to imagine it benefiting their lives. A case study provides prime material for multimedia, which expands its reach to a wider audience of visual and auditory learners, and boosts SEO across platforms. You can film a case study, add pictures or infographics to the written version, and publish a podcast of the script. Customer stories are invaluable pieces of marketing collateral; case studies let you maximize their potential. Case studies often necessitate keywords that help websites rank higher on Google, because at the core of any case study is a specific product or service a customer used to solve a problem. Fresh content with keywords pertaining to your products or services often improves the website’s visibility on searches where those words are used. The narrative structure of a case study makes it easy to incorporate keywords that boost Google rankings for specific searches. You can only conjure up so many “How-To” blog posts before your imagination goes sour. Case studies cure content marketing creativity blues by spotlighting unique customer experiences. With your customers in control of the narrative, no two case studies will ever be the same. Your products or services are promoted in compelling, original stories unlike any piece of content created by your competitors. Destroy any apprehension you might have about approaching customers to share their experiences; case studies can be used as part of a mutually beneficial customer appreciation program that builds stronger business relationships (and potential brand advocates!) With this approach, you don’t ask for a favor from your customer- you offer a benefit. Case Studies are like stories, but real ones with real problems and parameters. Sometimes, the solutions can be applied to new problems, but in most cases, case studies just provide an insight to the problem and urge the reader(s) for critical and analytical thinking and problem solving. 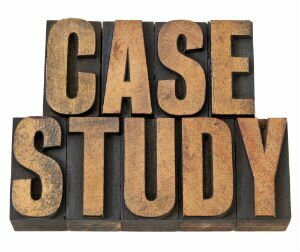 Case study is a rich repository of information, so it you have a business case of your own, share it, promote it, use it to train employees and leverage it as a business asset!